Love your feet more with the ultimate in workboot comfort. Engineered for comfort and safety with Oliver’s unique comfort system footbed. We guarantee you won’t want to take them off. COMFORTcushion® uses a combination of cellular urethane and PORON© to protect the heel and ball of the foot by providing superior cushioning and shock absorption... this reduces foot, leg and lower back fatigue. 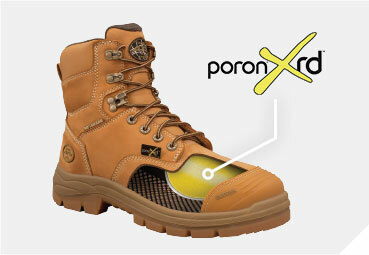 PORON© retains its original shape and cushioning characteristics for the life of the shoe. 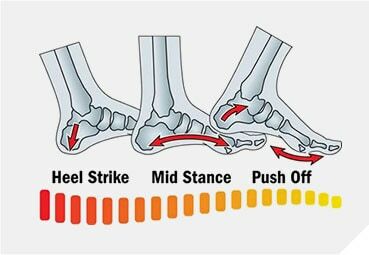 The footbed is what you feel most when you walk. It must be tough, stable and soft all at the same time. The Oliver footbed is designed to keep your heel from ﬂ attening, receiving impact and send it in the right direction. We use technically superior materials to ensure healthy feet all day long. 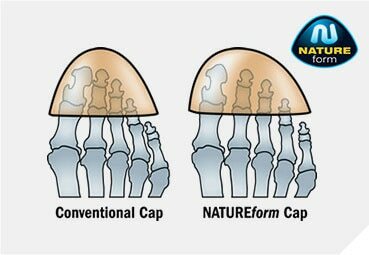 Oliver NATUREform® toe caps have a wide profile shape to suit your foot and are padded with a latex cushion liner to ensure toes are comfortable and not in contact with the cap. Oliver boots with NATUREform® caps are licensed to the Australian and New Zealand standard AS/NZS 2210.3. PORON© XRD™ Extreme Impact Protection is a unique new lightweight material designed to offer breathability with maximum absorption and dissipation of energy on impact. The XRD™ material is also treated with a microbial protection that help prevents the growth of bacteria, colours and stains. PORON© XRD™ gains its softness and flexibility when at rest while above the glass transition temperatures (Tg) of the urethane molecules. When stressed at a high rate or impacted quickly the Tg of the material reaches a point when the molecules momentarily ’freeze’ like water into ice. Thus the material firms to form a comfortable protective shell that absorbs and instantly dissipates up to 90% of the impact energy again and again.